When it comes to training dogs, there are many ways that you can improve the process. If you are a first-time dog owner, do not panic if your training attempts are not going as well as you expected, everyone has to start somewhere. In the case of particularly unruly dogs, you may need to invest in some products to help with training. One of the best products for use in house training dogs is the home kennel.﻿﻿ The kennel provides what is essentially a separated living space for your dog, so it will learn to treat the kennel as if it were its own home. This is particularly useful for dogs who have trouble with potty training. If you position your kennel inside of the house and let your dog stay inside of it, your dog will soon learn to stop doing its business indoors, due to dogs not wanting to soil their home environment. Dogs often perceive the interior of a home as if it were a forest or some other larger environment. Due to dogs perceiving a house in such a manner, they will often do their business somewhere where they do not sleep, and they will not perceive this as soiling their own home. A kennel is an excellent way to make your dog understand that the entire house is its home. This is not the only use for a kennel; you can also use your kennel in your backyard to ensure that your dog gets some fresh air throughout the day without being able to escape. Before we get into our review, we will go over some of the essential characteristics to search for in your ideal kennel. The first thing to consider when buying your kennel is the size. While you certainly do not want to purchase a kennel which is too small for your dog, you will also want to avoid purchasing a model which is too large. An overly large kennel will leave your dog room to do their business in one corner, making it harder to potty train them. You will also want to consider the space that you have available to place your kennel. If you purchase a large kennel; and you find that you have no room to place it, you will have to return it and wait for another to arrive. This means that it is imperative to measure the dimensions of the intended spot for your kennel. It is also important to ensure that your kennel is durable. This aspect is even more important if you have a dog who tends to be a bit of a troublemaker or an escape artist. Less durable kennels can be escaped or may even pose a danger to your dog if it attempts to make its way out of it. This kennel is manufactured by PetSafe for a wide variety of small to medium sized dogs. It includes several features that make it one of the better choices regarding outdoor and indoor kennels. While it is recommended for use outdoors, there is no reason why it is not effective as an indoor model as well. This kennel includes several quality of life features such as an optional SunBlock top which ensures that your pet will remain in the shade, even on the sunniest of days. 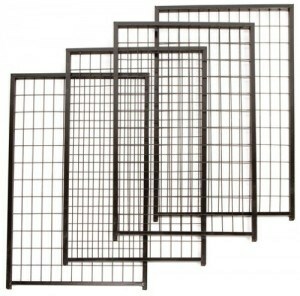 It also features a pinch proof gate that can be installed to open to the right or the left. We were quite frankly impressed by the build quality of this particular kennel. 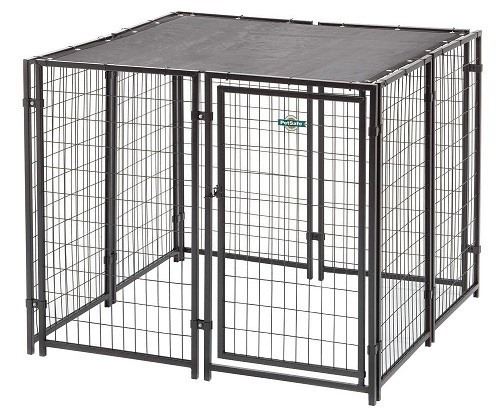 After having reviewed other types of kennels in this price range, we did not have high hopes for this model. We are happy to admit that we were pleasantly surprised. The side panels of this kennel are highly resilient, even if you have a rowdy dog when tends to claw and bite at the walls. This is an excellent design choice which ensures that your dog will not be able to escape from the kennel, no matter how hard it tries. Beyond the durability, we were impressed by the inclusion of the SunBlock top for outdoor use. Far too many other kennels do not come with an included sunshade to keep your dog both cool and comfortable. 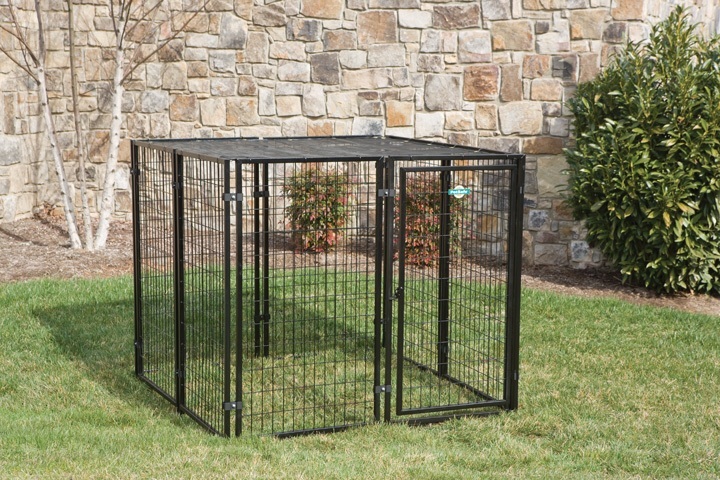 The rust resistant construction also ensures that you can place this kennel outside without fear of rain. After going over many customer reviews, we have found some pertinent second opinions on this product. Most customers were impressed by this product’s easy setup process. Unlike other home kennels, this model can be set up within an hour of work by a single person. This is better than most of the competition, some of which require two people to assemble. As for common gripes, many customers are disappointed by the quality of customer service offered by the parent company. While this may be unfortunate, you will most likely not have to deal with customer service thanks to the quality of this product. If you are looking to buy this product, you will typically find it available from online retailers such as Amazon. The price ranges depending on where you choose to buy it from, but it is typically in the range of 200 to 300 dollars. If you are looking for a dog kennel for either indoors or the garage, this model provides a reliable yet slightly pricey option. We hope that this review has helped you decide on the right kennel for your needs, and do not hesitate to comment if you have any questions.